Meg's Food! 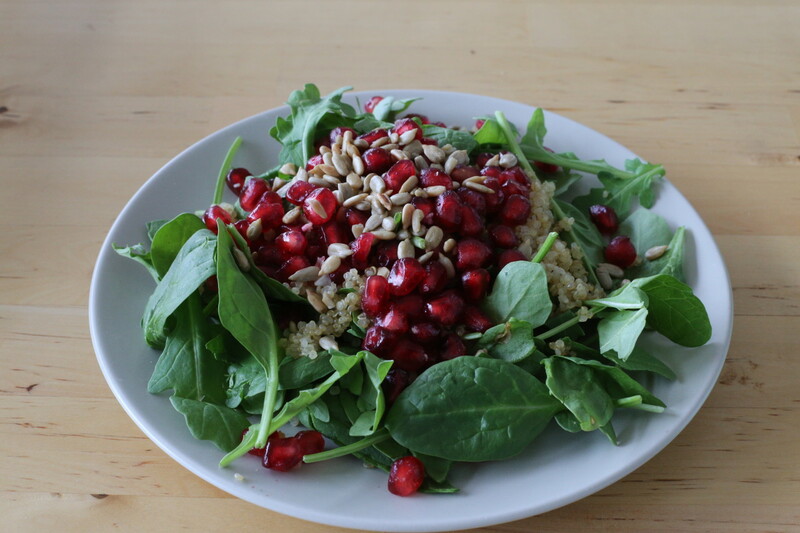 | Winter Salad with Crispy Quinoa - Meg's Food! Let’s start the year off with a salad. We’ve all spent the past few weeks (or month…or more) drinking and eating more than we want. So every January I like to take it back to basics and make sure my meals are packed with fresh, nutrient-packed ingredients. Some of winter’s best produce goes beautifully in a salad. Like pomegranate seeds, those jewels of winter. 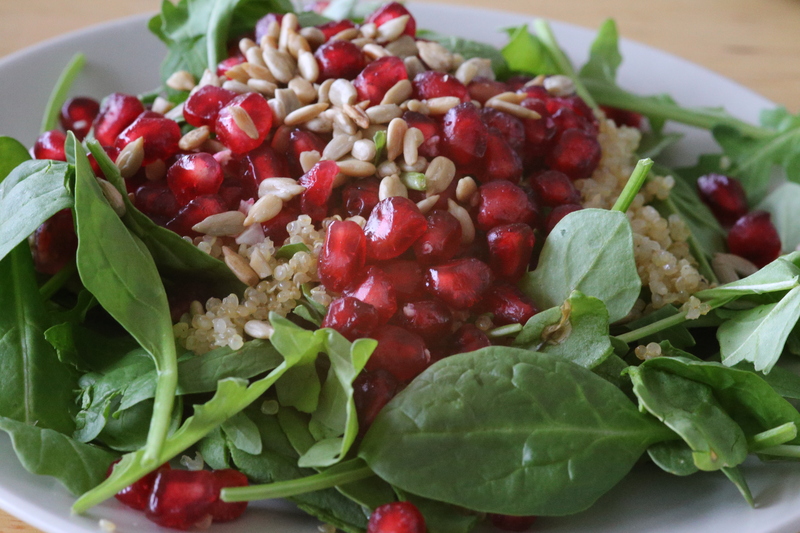 This salad starts with arugula and baby spinach, and is topped with crispy quinoa. I love eating quinoa this way – cooked and then stir fried, it’s absolutely delicious. Top with pomegranate seeds, sunflower seeds, and a tangy yogurt-lemon dressing. Total lunch goals. Perfect as a light meal, or a side dish to your winter comfort food. Combine quinoa with 3/4 cup water in a small sauce pan. Bring to a boil, reduce to a simmer and cook until water is absorbed. Fluff with a fork. Transfer to a container and cool completely (overnight is usually best). Heat olive oil in a medium saucepan. Add quinoa and cook, stirring, until quinoa starts to get golden. To make dressing, whisk together lemon juice, yogurt, apple cider vinegar, and honey. Whisk in olive oil. Season with salt and pepper. Toss arugula and spinach with dressing. 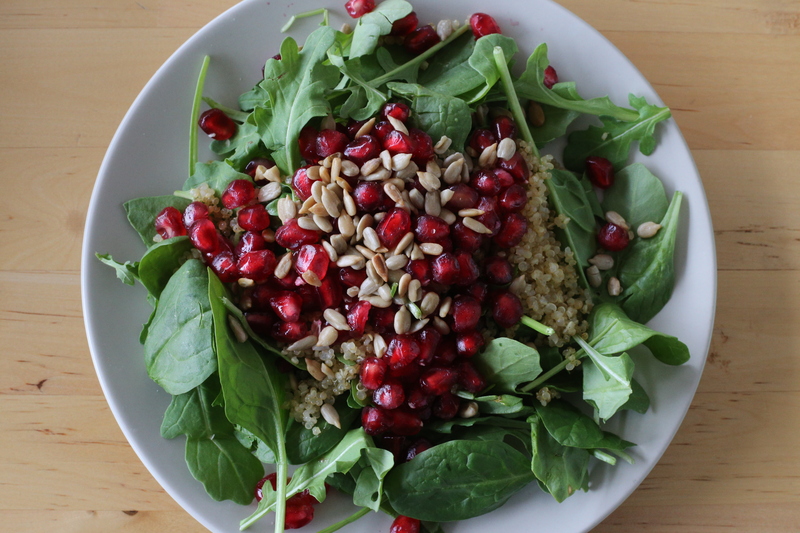 Top with quinoa, pomegranate seeds, and sunflower seeds. This entry was posted in Lunch, Salad and tagged lunch, pomegranate, quinoa, salad, sunflower seeds, winter. Bookmark the permalink.